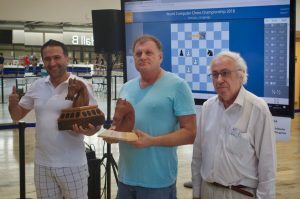 Komodo completed the triple this year by also winning the World Computer Chess Championship 2018 after a play-off with GridGinkgo. GridGinkgo became second after it lost the play-off with 1½-½. Because Jonny won from Leela Chess Zero, it became third. The photo shows the Komodo team, Mark Lefler (c) and Erdogan Gunes (l) who received the Shannon Trophy (and replica) from the chairman of the ICGA David Levy.